Four Philadelphia area education leaders recently went shooting with Olympic athletes of the US Army’s Marksmanship Unit. 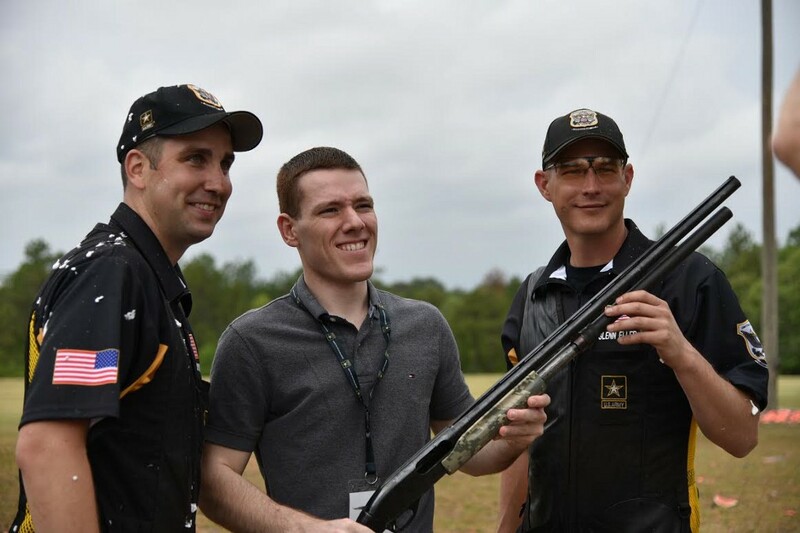 Pugh with two members of the US Army’s Marksmanship Unit, who both competed in the Olympics. Photo credit: Chris Camacho, Public Affairs Specialist, US Army. Four Philadelphia area education leaders recently went shooting with Olympic athletes of the US Army’s Marksmanship Unit at Ft. Benning, Ga. Attendees were from leadership positions in both K-12 education and higher education from Philadelphia and South Jersey. This was part of the US Army’s Community Partners Program as a way for the Army to foster ties with community leaders. Attendees had a private demonstration by the US Army’s Parachute Team, the “Golden Knights”, watched a demonstration by the Army’s Marksmanship Unit, met with military leadership and tried their hand at both pistol and shotgun shooting under the guidance of Olympic athletes. Through this, the attendees were further exposed to the Army, including opportunities for students and educations. Attendees represented the US Army’s Mid-Atlantic Recruiting Battalion, which covers New Jersey and parts of Pennsylvania, Delaware, and New York. This is under the Army’s First Recruiting Brigade and US Army Recruiting Command.